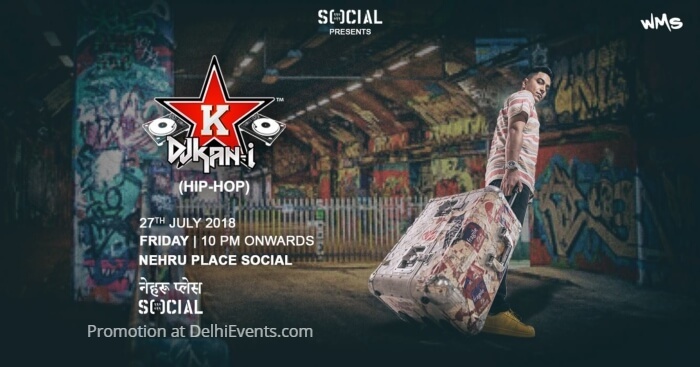 Event Description : Social along with WMS are thrilled to bring back to you the best of Hip Hop with DJ- KAN-i. Get your dancing shoes on and sway along the exciting beats of DJ KAN-i with fresh tropical cocktails and a variety of appetizing dishes! About the Artist: Listed among the Top 10 Video Battle DJ's in the world, DJ KAN-i was the first to introduce Video Turntablism in India. Chosen over hundreds of DJ's from around the world, he participated in Video DJ Battle, at the 2nd Annual Video DJ Conference, Las Vegas in September 2012. A celebrated artist, he has been acclaimed by renowned Hollywood celebrity DJs- DJ Vice, DJ Mister E, Joshua Carl and Mikey May to name a few. DJ KAN-i's work has been greatly loved, applauded, and respected by the Western DJ community. His unique tunes and beats along with the ability to captivate his audience has led him to win some eminent awards. MyFav Award's "Best Hip Hop DJ" 2015- 2016, marks his fourth win of the coveted title. He has also been awarded "India's Best Hip Hop DJ" three years in a row. Besides winning these titles, he has also had the privilege of performing at popular music festivals and locations like the NH7 Weekender, Pune, and Supersonic Night Clubs.